If you don't have the space to grow out, why not grow up? Look at bare balcony walls and back fences with a new lens and learn how to use small spaces innovatively. Randwick Sustainability Hub is about to install a few examples of vertical gardens in the Permaculture Interpretive Garden. Visit our courses and workshop page for more details. You can visit Barrett House's vertical garden at 6 Barrett Place, Randwick. 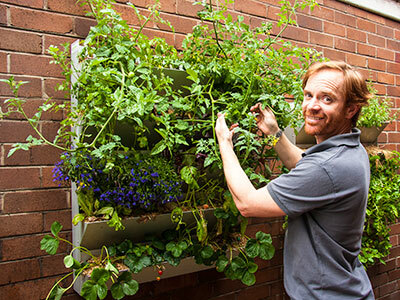 You can read about installing vertical gardens at the ReduceYourFootprint website.